This exercise is an easy and entertaining way to learn the major pentatonic scale. It will efficiently teach you its unique sound and help you hear what the keys are going to sound like. There are two 'verses' to the lyrics. The first verse describes how the melody moves up and down through the tones (the 'contour' lyrics). Three steps up and back and rest. Three steps down and back and rest. One up, one down, one up and rest. One up, one down, one up and finish. The second verse names the tones in pentatonic shorthand (T, 2, 3, 5, 6) as you play them. This first page has the practice drills for the three all-white-key major pentatonic scales - C, F, and G - plus the one-black-key D and B flat pentatonic scales. (Major pentatonic scales always have one fewer black keys than major scales proper because the seventh and fourth tones of the full major scale - which always have an accidental in the sharp and flat keys respectively - are missed in the pentatonic scale. 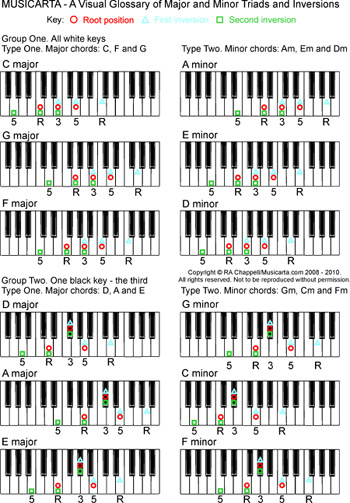 The number of black keys in the major pentatonic scale is shown in brackets under the key name in the video. You play the drill with two hands, thumbs on the tonic. Copy the first drill, in C.
As you can hear (! ), it doesn't matter whether you can sing well or even in tune. You could even recite or rap the lyrics. It's just involving you in the pitch contour and getting to know the sound. Because F and G pentatonic major also have no black keys, the look-and-feel of the next two drills is exactly the same - just starting from a different place. The drill in D uses the second verse lyrics - you sing the name of the pentatonic scale-tones as you play them. Over time, this will teach you to accurately judge 'intervals' - leaps in pitch of various sizes. You might find it strange using the thumbs on B flat in the following drill. Move your hands well up to the back of the keys and don't be shy of playing e.g. the D in the right hand right up between the black keys - there IS enough room for your fingers! Before you go on the Page Two, go back and sing the Verse Two scale-tone name lyrics for C, F, G and B flat. The scale-tones on the virtual keyboard are labelled to help you. The rest of the major pentatonic drills are on Page Two of the module.